While Nasim is busy traveling, I am going to try to fill in for a few days and post some articles. Although there are a number of reasons why I have not been writing for PL for a while now, one of the main reasons has been simply lack of time! I hope our readers can forgive me for that, but going forward, I will do my best to show up a bit more often, since we need more female content here :) Anyway, since I get a lot of questions and requests from our readers regarding food photography (many of whom are novice photographers and food bloggers), I decided to do a quick review of Nicole S. Young’s book titled “Food Photography: From Snapshots to Great Shots” that I bought a few years back for my own personal use. Note: Since my purchase, Nicole has already published a Second Edition of the book, with more up to date information. So if you are planning to buy this book, I would recommend to get the latest and greatest version. When I started learning about food photography (see my food blog with a list of recipes), there weren’t many books to learn from. With little to no budget, I mostly acquired knowledge from random food bloggers and relied on my technical background as a wedding and portrait photographer. Learning a new craft can be a long and painful process, but if you are patient and persistent enough to stay on track, you will eventually succeed. Unless you have a big budget to hire a professional food photographer who can teach you their craft in a jiffy (not happening), you will most likely be scrambling for information from various sources to build yourself up. The good news is, you don’t really need to worry about that anymore, since quite a few photographers and food stylists have already done the hard work by creating excellent material to aid others in the learning process. In my humble opinion, “Food Photography: From Snapshots to Great Shots” by Nicole S. Young is one of such materials. While it might seem a little easy or lacking for seasoned food photographers, it is a great place to start for those wanting to learn the basics of food photography. 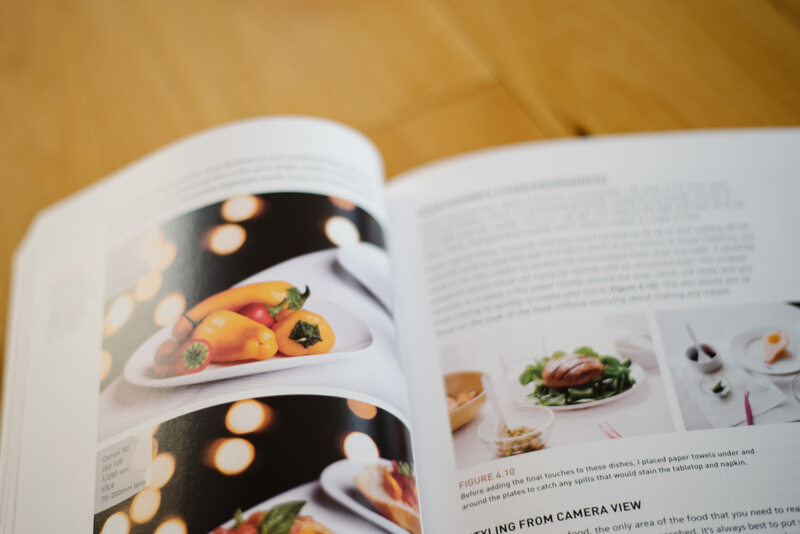 So to clarify, this book is geared towards more of an entry-level food photographer or a food blogger, who is looking to solidify their core technical and inspirational base. This book is for photographers who are also their own food stylist. If you’ve been photographing food for years and looking into “spicing things up” and taking your skills to the next level, this book is NOT for you. Many negative reviews of this book come from people who have a solid footing in photography, which in my opinion, is not really fair, considering the intention of the writer to begin with. Every teacher has a different style of teaching and every teacher chooses their tools according to their curriculum and beliefs. While my technical approach is a little different than Mrs. Young’s and I use different photographic gear than her, the principles outlined in this book are true to what she has to offer. Mrs. Nicole starts with a basic introduction of correlation between Aperture, Shutter Speed and ISO. She talks about the importance of choosing the correct while balance, the differences between RAW and JPEG, etc. She chooses to use Adobe Photoshop for post-processing work and she takes you through the steps she uses to achieve her final results (if you don’t use Adobe Photoshop, you can still benefit from using similar steps in other photo editing platforms). Her next chapter is dedicated to choosing camera equipment and accessories for food photography. She explains what gear she uses and why. Mrs. Young also gives a good amount of general information about lenses, focal lengths and their use. These recommendations can be used across the board for different camera brands. Next, she goes into lighting the subject, which in this case is food. There is only one case scenario, shooting back-lit and making that scenario work really well. While there many other options of lighting food, Mrs. Young chose to showcase back-lit food photography the most. She also talks about lighting modifiers and accessories one might need to use to get the shot. These accessories can be used in different case scenarios, regardless if you are shooting back-lit or not. As a food photographer, I do not have access to a fancy food stylist. So, I end up styling my food according to my own taste and according to my best knowledge. Mrs. Young dedicated a chapter to this concept and gave pointers on how to make food look more appealing by using simple tools, without making it look plastic and inedible. I really wished this part of the book was bigger and had more content going its way. While learning photography itself is half the challenge, styling food and having a good eye for design is not something that everyone can do or master. However, it can be taught and can be improved. For the slot allocated for food styling though, Mrs. Young gives sensible tips on how to use professional tricks like “sit-ins”, correct framing, and usage of live view to make sure the end result of your food looks much better than before you started reading this book. 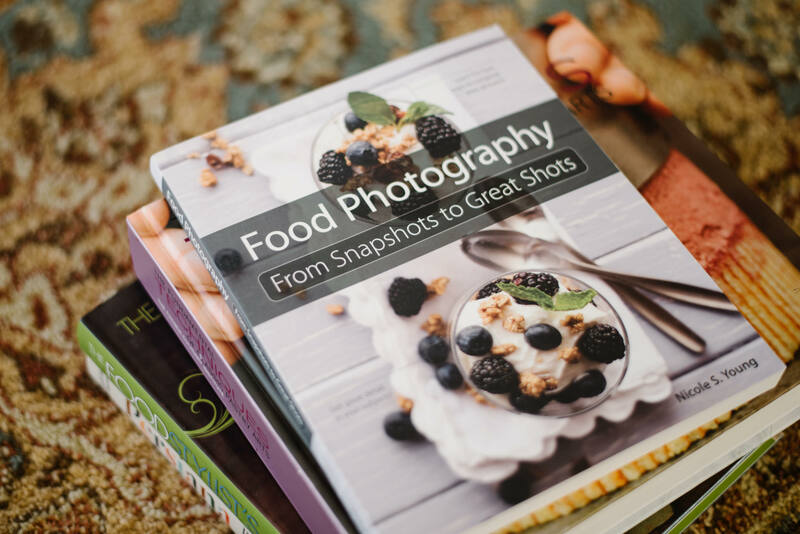 Overall, I found “Food Photography: From Snapshots to Great Shots” to be informative and well-written. 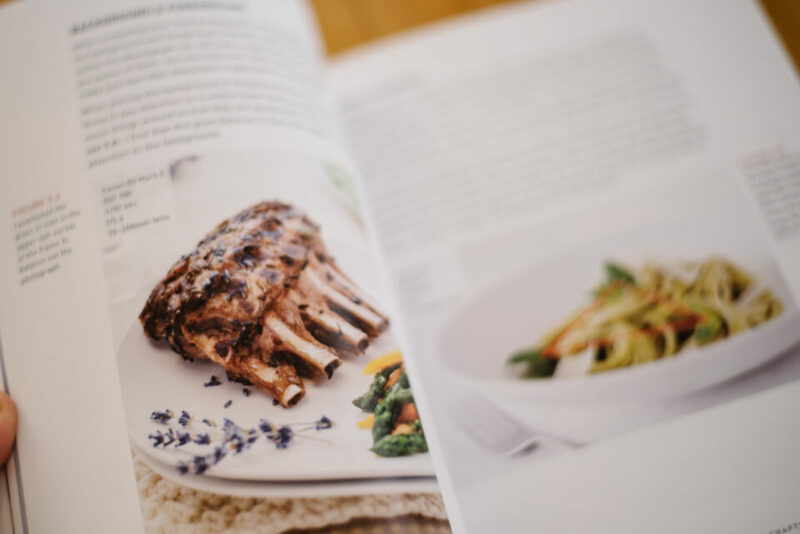 It is pretty straightforward, easy to understand and has a quite a fair amount of beneficial information to jump-start your food photography. While the book could have been expanded to cover many more topics, it would have potentially made it overly complicated for beginners, which might not have been the original intent of the author. In my view, it is a finished product for its intended purpose and it could serve as a preparation step for other tutorials to come from Mrs. Young in the future. I’m so glad to see an article by you–and on my favorite subject: food, and photography thereof. Photographing food is not as easy as people might think–many subtleties of lighting, arrangement, color, etc. Nice to see you are shooting this with a D750; I recently purchased one and am enjoying its capabilities. Hi Art, thank you for your feedback. Photographing food is very challenging as many cooked through food doesn’t look very appealing after sitting on the table for only a few minutes. To this day I haven’t used “dummy” food in my food photography. That is probably the most challenging part. D750 is a remarkable camera. I am planning on writing more for PL. I will see you around soon? Very nice. 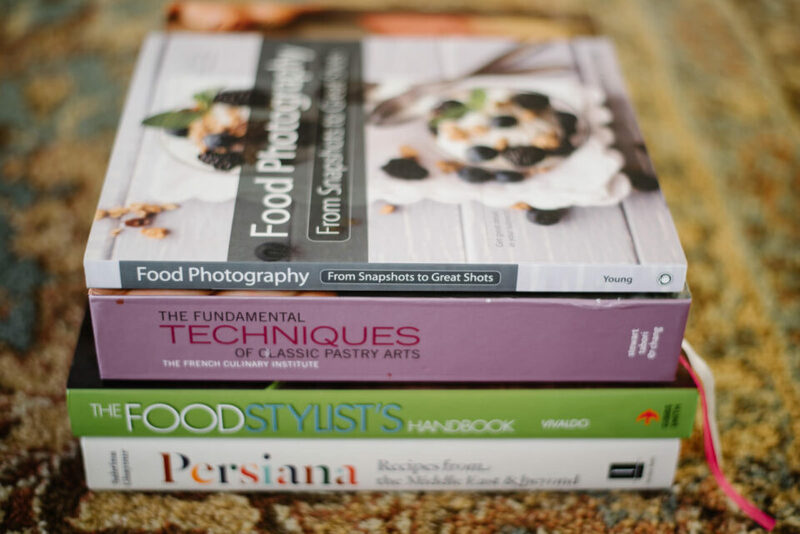 I noticed that you also have “Food Stylist’s Handbook” in that stack of books. It would be great if you could review it, too. I am also interested in more advanced food photography books if you, or anyone else, has recommendations. I will try to post more regarding food photography and products which help improve this craft. Stay tuned. This book may be useful but I cook but do not take pics or blog. Your blog is awesome – the instructions are so cool with pictures of ingredients and steps. I like the bloggers who show the ingredients before they are opened and placed into bowls. It tells me which branch and how to buy. Hi Chris! Thank you for your feedback. Cooking is probably the most challenging process of it all. But just like any craft, with time and persistence it becomes like second nature. That being said, I do have fiascoes in the kitchen time to time. Especially with recipes that are not thorough. Photography part of it is an extension of your love to cooking. If you cook lovingly, you will learn photographing lovingly, too. After all, it is your baby, in some sense. I hope to see you around often.